I joined A BOM from Fat Quarter Shop that is called Bertie's Year by Bonnie Sullivan. 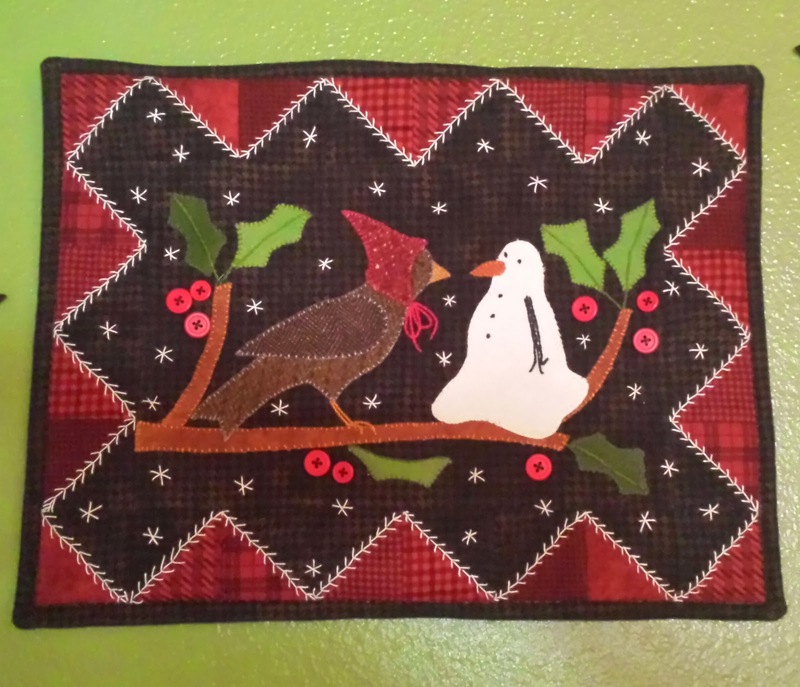 Each month you put together a mini quilt 13 x 17 inches featuring a bird named Bertie that is featured on a block that is centered around what Bertie is doing each month. It is a mixture of a pieced block, applique, and embroidery stitches. I really was most attracted to the colors they put this one together with and each month they ship you a complete kit with all the fabrics. I really enjoyed putting it together this month as it was a project I could sit in front of the TV and spend a little time with the hubby in the evenings. A few of the hand stitches were new to me but with a little practice I figured the fly stitch out (the white circling the center) and had fun learning some new skills. This post has been brought to you from my new smartphone. I finally gave in and decided to upgrade this year. While I Love checking my email and following my favorite blogs conveniently from anywhere, I would have to say creating this post via my Samsung Galaxy 4 has not been the easiest thing to do. I thought it would be so easy to post a picture directly from my phone but instead I have spent over an hour trying to figure out how to do it. Even though the photo was clearly on the phone it was not available in the drop down choices on the list. I could save the photo to Flickr but still no way to get at it from there to here. I finally had luck getting it uploaded to Picasa and could then get it onto the blog. I have a lot of learning ahead of me.